for Robert, Agata, Franek and Arek. What do you do when you have two young children and only one small bedroom at home? How do you give each child the space to sleep and play and grow when aesthetics are also important to you? Well, if you're architects like Agata and Arek, you sit down and design your own kids' furniture, exactly how you like it. RaFa Kids' furniture designs are tried and tested by Agata and Arek's own two little boys, Franek and Robert. As these few photos show, their parents have paid every attention to detail, creating solid, functional and playful designs that can be adapted to each child and room. 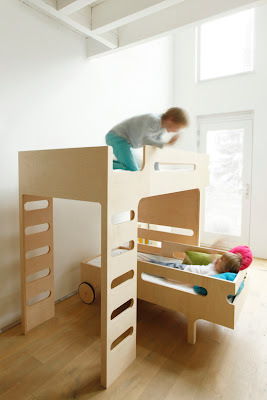 The 'F Bunk Bed' has two ladders, for example, and its supporting base wall is perfect for displaying kids' artwork. "F" is not just a bed, it's a den, a reading space, a little corner to play in, and of course, the 'R Toddler Bed', fits perfectly underneath. It can be wheeled in all directions (even into mum and dad's room), for extra fun. RaFa Kids also offer a refreshing collection of modern, original bedding, which I'm sure will appeal to kids of all ages (it's nice to see some good graphic designs for boys for once), and parents looking for something slightly different. I love the vision test design by StriKaholic, in particular. Take your time browsing their site, they've only just launched today and I am impressed with their selection. I also know how hard they have both worked, and I wish them great success. 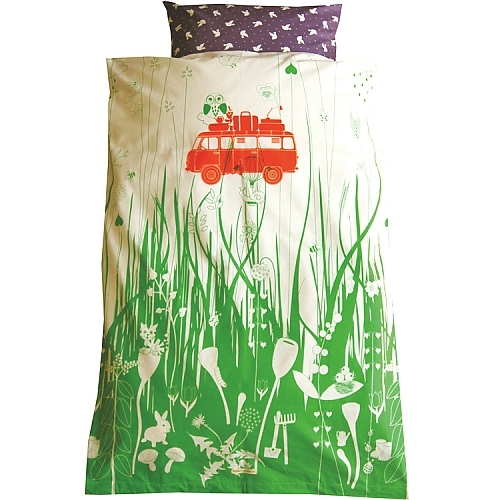 Fun, functional furniture and bedding for the modern home.